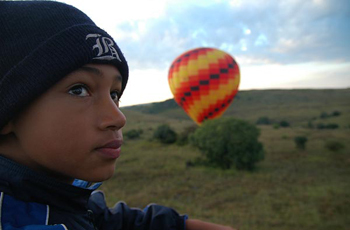 If you have a morning free in Johannesburg or Pretoria, why not rise to the occasion, and do a hot air balloon flight … The Air Ventures hot air ballooning operation is located near Johannesburg, about 45 minute drive north of Sandton. The flights operate each morning (subject to weather of course). 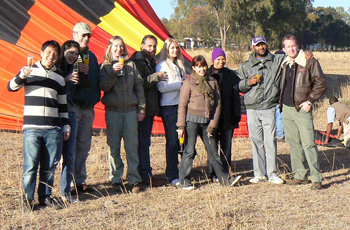 The hot air ballooning experience entails a serene 50 minutes, during which you float over the picturesque countryside of the Cradle of Humankind and Magaliesberg, with a glass of bubby in hand. The area is characterized by gently undulating grassland hills and valley bushveld. A number of farms, small game reserves, dams, homesteads and tree lined country roads make for an enchanting landscape over which to drift - sometimes at height, and other times at tree top level. The Air Ventures Hot Air Ballooning operation caters for individuals and groups, as well as the romantics who dream of an exclusive balloon flight for two (…and the pilot of course!) – a notoriously romantic option for popping the question, or just doing something special for your special someone! 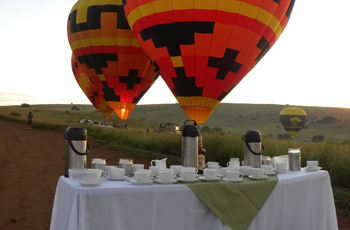 There are two hot air balloon flight packages, namely the Classic Flight Experience and the Safari Flight Experience, that would make use of one of the larger passenger balloons or the Exclusive balloon. 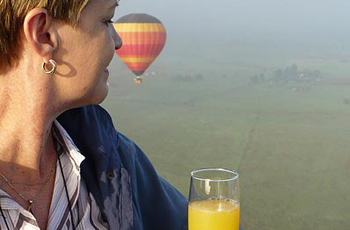 The Safari Flight experience offers passengers a more ‘African safar’ experience. The flight launches from inside the Rhino and Lion Nature Reserve (near Johannesburg) and gives passengers the opportunity to view game from the air.